I had the pleasure of teaching a fabulous floral and cooking class with my good friend Tam Ashworth owner of Isari Flower Studio. (More on that class in a few!) This is the floral salad I created. I love a salad like this at a dinner party! It doesn’t take much effort to arrange a salad like this and I think it makes such a huge impact for your guests. fresh herbs such as basil, parsley, tarragon, etc. 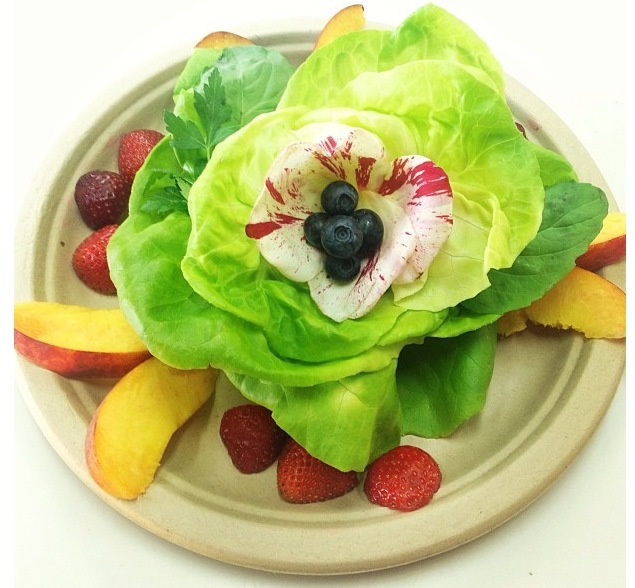 Stack the lettuce leaves on the plate making a flower shape. Garnish with the fruit. Combine all the ingredients in your food processor except olive oil and pulse until the shallot is finely minced. Stream in your olive oil. Serve immediately or make sure you stir if ingredients separate.